SCHUYLER COUNTY—Legislator Delmar F. Bleiler Jr. will retire from the Schuyler County legislature at the end of the year. Chairman Thomas M. Gifford presented Bleiler with a certificate of recognition at their regular meeting Monday, Dec. 14. Bleiler began serving on the legislature in 1998, and for the past 12 years has been on a number of other committees, councils, and boards. “His dedication, compassion, and understanding has had a tremendous impact on all throughout the years, and he will be sorely missed. That’s an understatement. We wish him success in his future endeavors,” Gifford said. “I do want to say thank you to all of you guys, it’s been fun, it’s been challenging at times and I’m sure more challenging for you to work with me than it has been for me, so I appreciate all the dedication that you guys have put in. It’s been a pleasure working with you, thank you,” Bleiler said. The legislature voted to accept the offer from Jeff Bizelka of Brooklyn to purchase the Burdett Post Office for the amount of $1,000. The full amount of the purchase will be made to the Schuyler County Treasurer by Dec. 31, 2009. At the Legislative Resolution Review Committee meeting Wednesday, Dec. 9, 2009, County Attorney James P. Coleman said, “He shows every promise of holding up his end.” The legislature will decide what to do with the money in the future. The legislature also approved a number of contract renewals, renewal agreements, lease agreements, and authorization of contracts including the authorization of the contract renewals for 2010 with probation, public health, mental health, office for the aging and social services for the families first program, authorization of lease agreements with the village of Watkins Glen and county highway. The legislature did agree to withdraw the authorization of the ongoing contract with L-1 Identity Solutions for electronic fingerprinting at the sheriffs office. This will then allow the sheriff’s office to have electronically scanned fingerprints, with no equipment cost to the county. There needs to be some clarification from the company, however, and they have not heard any new things from their attorney. The legislature also discussed the present value analysis regarding the shared services building. They are looking into the 50 percent rule which would require high interest payments at the beginning and then the payments will become lower at the end, and it will save about $80,000 over 25 years. This does mean that the benefits would also occur about 15 years from now. 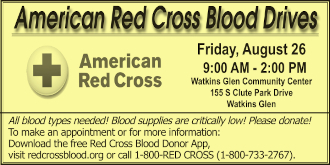 The counties financial consultant has recommended the 50 percent rule, and the village of Watkins Glen has voted in favor of this rule. The legislators would like to re-do their bond reading and check over some other analyses before making a decision. 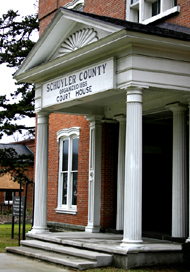 The Schuyler County Legislature will hold a year end meeting Monday, Dec. 28, 2009.